Discover world class archaeology, teeming seabird colonies and fantastic coastal walking on this memorable trip to the Northern Isles. Explore Orkney's stunning archaeology, wildlife and landscapes on this wonderful trip to the Northern Isles. Sitting off the north coast of Scotland, the Orkney islands are a world apart. Surprisingly lush and fertile, for many centuries this beautiful archipelago belonged to Norway; even today Orcadians retain a distinctive identity and are keenly aware of their Scandanavian heritage. 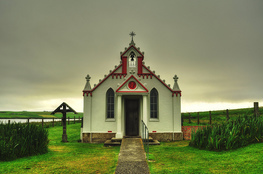 Orkney is an island enthusiast's paradise, with not one but an amazing 20 inhabited islands...and a further 50 or so that are uninhabited. Most tours concentrate on the largest of these islands (called "Mainland" by Orcadians) but here at Hidden Hebrides we like to do things differently. On this brilliant holiday we will, of course, be visiting Mainland Orkney, with its world famous archaeology. 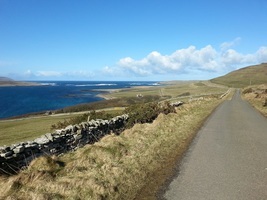 However, we will also be taking day or overnight trips to 3 of Orkney's fabulous smaller islands - Hoy, Rousay & Westray. Orkney has outstanding wildlife and landscapes, but its real attraction is its archaeology and cultural heritage. Nowhere in northern Europe is there such a dramatic concentration of spectacular archaeological sites. Stone circles, burial mounds, a stone age village, iron age forts...almost everywhere you turn there are more traces of our early ancestors. It is no wonder that central Mainland has been designated a World Heritage Site for its outstanding collection of archaeological remains. 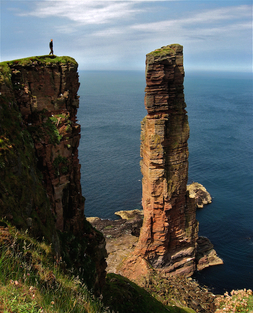 Our Orkney Islands tour is one of our most relaxed walking holidays. Distances covered are generally modest (average 5 - 7 miles a day) and the terrain is easier than many other Scottish islands. We will be taking time to visit some of the finest archaeological sites, as well as keeping a good lookout for the spectacular wildlife that the islands have to offer. One final point to note about this holiday is the quality of the food - Orkney has some really excellent restaurants and pubs and we will be sampling as many of these as we can fit in during the week! The tour starts with a pick up outside the front entrance of Inverness train station at 1.30pm. From Inverness we will travel by minibus to John O' Groats at the northern tip of Scotland where we will catch the evening Pentalina ferry across to Orkney. Once on the islands you will be taken to your guest house in Kirkwall, the island's attractive and historic capital. We will be eating most nights in some of the town's excellent restaurants and pubs. We will start the week in style with a visit to Skara Brae. This remarkable village appeared out of the sand dunes after a storm in the 19th Century and is now widely recognised as the best preserved stone age settlement in Europe. In the afternoon we will walk along the spectacular cliff tops of Marwick Head, visiting the striking memorial to Lord Kitchener who was drowned when his ship hit a mine and sank a few miles off this headland in 1916. We will end the day with a stroll around the beautiful tidal island of Birsay, with its fascinating remains of a Viking village. Our second day will involve a ferry day trip to one of Orkney's most northerly outliers, the beautiful island of Westray. We will be taking several leisurely walks around the island, including a visit to the spectacular cliffs of Castle O' Burrian, home to Orkney's most accessible population of puffins! Many of Mainland Orkney's finest archaeological sites are nestled in a relatively small strip of land between the Loch of Stenness and the Loch of Harray. Today we will be exploring this area - the Neolithic Orkney UNESCO World Heritage Site. We will walk between most of the sites, including the spectacular burial tomb of Maes Howe, the fine standing stones at the Ring of Brodgar and the Stones of Stenness, as well as visiting the exciting ongoing excavations at the Ness of Brodgar. In the afternoon we will explore Orkney's second town, Stromness - home to the wonderful Orcadian poet and author George Mackay Brown - taking a short coastal walk before eating in one of the town's excellent restaurants. Another day trip today, this time to the lovely island of Rousay. Fabulous coastal walking, with yet more remarkable archaeology - the walk along Rousay's south west coast has been described as including the most important historical mile in Britain. 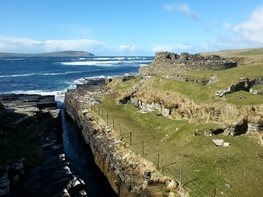 Highlights include a monumental chambered burial cairn and Mid Howe Broch, an impressive Iron Age circular fort on a spectacular coastal promontory. Back on the ferries again today, this time for a day trip to Hoy, the most rugged of the Orkney islands. In the morning we will take a walk out to the famous "Old Man", a spectacular sea stack first climbed by Chris Bonnington in 1966. Before returning back to our base on mainland we will go to the south of Hoy to visit the fascinating musuem at Lyness, which records the experience of islanders and servicemen during the two world wars. Our departure day will involve taking the ferry back to John O' Groats then driving back to Inverness. We will arrive back at Inverness train station at approximately 3pm. Grade: Easy - low level walks with a few gentle climbs. Some walking along the tops of seacliffs. One longer day out to the Old Man of Hoy but on good paths all the way. Some walking will be across moorland and away from paths. Cost: £1,050.00 - includes guest house accommodation plus breakfast, packed lunch and evening meals. Please note that prices for the guest house option are based on two people sharing a twin or double room. If you would like single occupancy of a room, we will do our best to arrange this. The single occupancy supplement for this trip is £120. Note that there is limited accommodation available on Orkney so single occupancy rooms are not always available for late bookings. Accommodation: We will be staying in comfortable guest houses in and around Kirkwall, Orkney's attractive little capital. All rooms will have ensuite or private bathrooms. What's Included: 6 nights accommodation, 5 days walking. Full board at local quality guest houses, with full Scottish or continental breakfasts. Packed lunches. Evening meals at local restaurants. All transport during the holiday, including minibus transport from Inverness - Orkney. Ferry crossings to Orkney, plus day trips to Hoy, Rousay and Westray. The services of a qualified and experienced Mountain Leader. What's Not Included: Transport to / from holiday departure point at Inverness. Entrance to archaeology sites where entrance fee is charged (we can supply clients with Historic Scotland Orkney Explorer passes for £18 per person which provide free entry to most sites). Travel insurance.